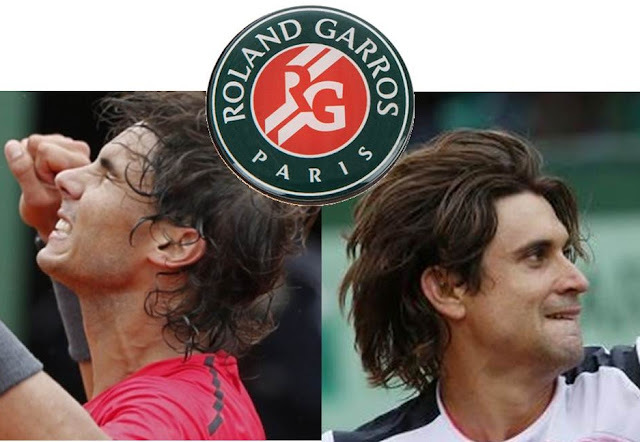 Unless you're a dyed in the wool fan of one of the Spaniards on the other side of the draw, this is the more eagerly awaited of the men's semifinal matches at Roland Garros. The current World No. 1 Novak Djokovic across the net from longtime World No. 1 Roger Federer in a rematch of last year's scintillating semifinal. There are precious few complaints from this corner of Tennisworld about this episode of Roland Garros redux. Djokovic enters this year's tilt with Federer in a bit of a different position from a year ago. He's not just now the World No. 1, but also the winner of the last three majors. Most importantly, he arrives with a bid for a "Nole Slam" (four majors in a row) on his racquet. His opponent is also treading unfamiliar ground. Federer, long accustomed to being on the brink of history, is cast instead this year as a potential spoiler. Federer could play spoiler, strangely enough, to Djokovic's bid for one of the few achievements in tennis he himself hasn't earned. Federer is entrenched, odd though it may sound as the World No. 3, without a major to his name in over two years and without the aura of inevitability that's almost felt his birthright in recent years. It's felt this year as if a more human, more fallible facsimile of Federer arrived at Roland Garros. Interestingly enough, you could say the same about the player formerly known as Robo-Nole. Djokovic started Roland Garros in fine form, bounding past early round opponents Potito Starace, Blaz Kavcic and Nicolas Devilder as if they were stationary. Then suddenly, the Serb struggled versus 22nd seed Andreas Seppi, dropping the first two sets before ultimately coming through in five. In the quarterfinal Djokovic dropped two sets and saved four matchpoints before local hope Jo-Wilfried Tsonga's nerves finally caught up to him. 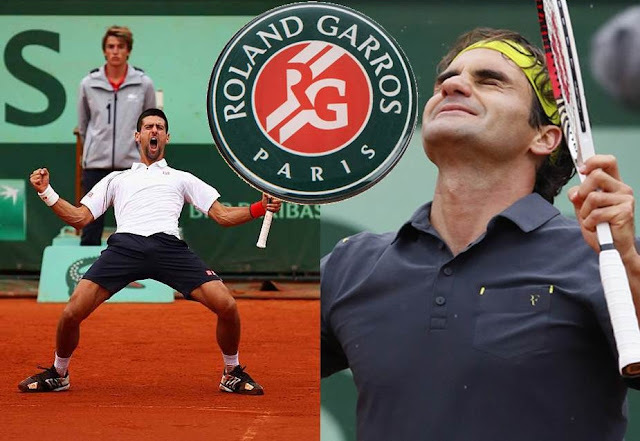 Djokovic closed the book on the last chance to keep the Coupe des Mousquetaires on home soil this year with a ruthlessly efficient 6-1 final set en route to his fourth semifinal at Roland Garros. After half of decade of appearing God-like between the lines, during this Roland Garros, Federer has had feet of clay. He's back in the semifinals for the seventh time, but the results have not come easy. Only in the first round did the Swiss great head for the locker room after three sets. Adrian Ungur, Nicolas Mahut and David Goffin all extended Federer to a fourth set while Juan Martin del Potro faded like a year old newspaper after collecting a two sets to love lead. Tests aside Federer is here and there's no one in the history of the game with as much big match experience as Federer. Federer leads his younger rival in the head-to-head 14:11, but five of their last six matches went Djokovic's way...all, but their last encounter at Roland Garros. Neither player has been on their world-beating form this fortnight, but two champions this decorated will certainly scrap and claw for a chance to fight another day. Not to cop out, but the man who shows his best tennis wins this match. Against opposition of this caliber, if one player or the other can't find his game, bet on his opponent steamrolling him. If one is playing well and the other is erratic, slow and steady will tin the race. The Pick: This entire fortnight I've been wondering, what's eating Roger Federer? He's not playing like the Federer we know. A four set lapse can be forgiven, a second wouldn't even rate as a shock. Federer has lost five sets thus far. If Del Potro hadn't physically lost his mojo and mentally lost his momentum,we'd be looking at this semifinal through very different eyes. But he didn't and we're not. Djokovic, for his part, has lost four sets thus far. Neither man is playing his best, but these days, I'll take the Djokovic B-game to get it done. This will not be an easy one for Rafael Nadal, let's start there. If Mark Twain were telling the story of this match, he would quote himself, "There are lies, damn lies and statistics." Here's a statistic for you, Nadal is 15-4 all time versus the World No. 6. Nadal's also a confidence-building 12-1 against Ferrer on clay (not to mention 12-0 since he won his first Roland Garros title in 2005). So, what are we going on about? Well, the fact that this is Ferrer's first Roland Garros semifinal is a surprise given the indefatigable Spaniard has been a top twenty player since 2005 and has seemingly been forever in the mix on the clay. The sixth seeded Spaniard is one of the fittest players in the game and never gives an inch. If anyone on the tour is going to hang with Nadal from a toughness standpoint, it's Ferrer. To get his shot at Nadal, Ferrer brushed aside early round competitors Lucas Lacko and Benoit Paire quickly. He beat 27th seed Mikhail Youzhny so mercilessly (0, 2 and 2) in the third round that the Russian wrote "Sorri" in the terre battue. Then Ferrer destroyed 20th seeded compatriot Marcel Granollers (3, 2, 0) in the fourth round. In "upsetting" Andy Murray in the quarterfinal, he needed a fourth set, but he eventually subdued the Scot 6-4 6-7 (3), 6-3, 6-2. His reward for such a ruthless display, a semifinal matchup with Nadal. We often discuss how the top three men have left just table scraps for everyone else on tour during the Trivalry Era. On clay, Nadal barely misses a crumb. No man in the Open era had ever won eight singles titles--let alone eight consecutive titles--at a single tournament until Nadal set up camp at the Monte Carlo Masters. The last time Nadal lost a singles match in Monte Carlo, he was 16 (the loss was to Guillermo Coria). He missed the 2004 edition of the event and hasn't lost there since. Nadal's built upon that base with a record seven titles at the Barcelona Open plus a record six titles at both the Rome Masters and the de facto clay court world championships at Roland Garros. Like we said, the guy doesn't miss a crumb. Shooting for his seventh title in Paris, Nadal devastated early round foes Simone Bolelli and Denis Istomin, dropping just nine game across six sets. Argentine Eduardo Schwank pushed Nadal, falling 1, 3 and 4; then Nadal went back to playing with fatal efficiency, crushing his 13th seeded buddy Juan Monaco 6-2, 6-0, 6-0 before staying the course versus an inspired Nicolas Almagro, winning 7-6 (4), 6-2, 6-3, in by far his most competitive match of the tournament. Where it gets interesting is that Ferrer played Nadal twice this year, at the final in Barcelona and in the semifinal of Rome. Nadal won both, but the scorelines were razor thin, 7-6 (1), 7-5 in Barcelona, 7-6 (6), 6-0 in Rome. That's as close as anyone has played the Spanish Bull, who hasn't lost a set on red clay all season. A brief lapse in concentration from Nadal and he would have watched Ferrer staking a claim to some of his beloved turf. Yes, Nadal came through, but at least three of those four sets could have fell either way. The Pick: There's not a player on tour who doesn't respect David Ferrer, he's what tour watchers often dub "a tough out," proving a litmus test for younger players as his only weakness is the lack of a consistent big weapon. Rafael Nadal though, is Rafael Nadal. He's the best player to ever take to the red clay. Sure, he could get tight, have a bad day, catch Ferrer on day when he's playing out of his mind; but if a healthy Nadal loses at Roland Garros today, it'll be a sizable upset to say the least. Defending champion Rafael Nadal’s pursuit of a record seventh French Open title remained on course as the Spaniard defeated compatriot and No. 12 seed Nicolas Almagro to advance to the semifinals at Roland Garros. Delivering might be simple and also obtain a enthralling Zentai Lycra Catsuit sign in said omega replica. Pick up a particular not to mention arouse your significant other from carrying skeletal Zentai Lycra Catsuit with sexual fulfillment. For the reason that every one of us are concious typically the general trends in your type market place have usually varying in your type environment. Swimsuit patterns modification being the fashion designers are actually replica watches trying to think up a specific thing latest and / or reviving itself typical patterns to completely different documents ever again. Taking an appropriate chop typical wedding day swimsuit might possibly subsequently turn out to be particularly tricky. One should go for on a double-breasted wedding day swimsuit that the someone might be higher not to mention thinner. rolex replica sale can be described as time honored swimsuit chop which may get higher not to mention small individuals take a look remarkable. It includes only two rows from links downwards the top of this dress and then a singular tab contained in the departed end. Choose time honored Mexican swimsuit that the groom might be further predominantly produced as opposed to some people. This unique time honored fake rolex swimsuit goes along with only a click singular tab line downwards the top, contrary to both of them rows. This unique swimsuit probably will make the owner turn up a more elevated not to mention decrease your partner's longer, rendering your man typically the vital phantasm of being a little bit of more delicate not to mention a more elevated. Nearl all females gain typically the Italian swimsuit for the reason that wedding day befits regarding individuals trend prefer main business enterprise and bosses. This particular wedding day swimsuit is really useful it will fit a large number of breitling replica sale styles of body's. Typically the shoulders are prepared wider and then the midsection tapers to make a triangular appearance, of which causes a solid affect typically the wearer.